Mothers & daughters (or aunts & nieces, big sisters & little sisters, etc.) 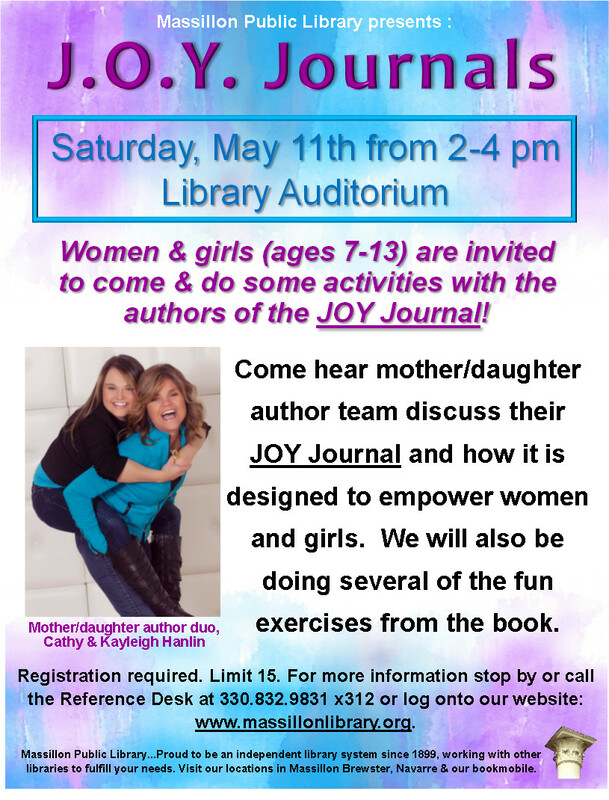 are invited to a special 2nd Saturday program at 2:00 pm on Saturday, May 11 to discuss empowering young women and do some exercises from the JOY Journal, led by the authors, Cathy Hanlin and Kayleigh Hanlin, a mother and daughter team. This program is geared toward girls who are ages 7-13, accompanied by their older female team member. Registration is required. For more information, contact Laura Klein at 330-832-9831, ext. 319. 2nd Saturday Massillon is a monthly event where downtown businesses come together and host a variety of entertaining programs.